The new derby format means there's more prizes than ever to go around. Mollie Bailey photo. One conversation kept coming up again and again during the Classic Round of the USHJA International Hunter Derby Championships: What’s the deal with the tiers? Colleen McQuay, who designed the format based off a similar system in the reining world, wrote a great piece about the format in our Aug. 12 Derby Championships Preview issue, and the USHJA has a flow chart. Colleen helped me really get my head around it, and I was able to explain it to two co-workers. Now I’m going to take another informal crack at it, out loud, as it were. Let’s see how I do. So this year the USHJA designated the 20 top derby money-winning riders as “Tier 1 riders” and everyone else is a “Tier 2 rider.” Your Peter Pletchers and Kelley Farmers and other derby superstars are Tier 1, and everyone else is in Tier 2. So Tier 2 has lots of top riders who don’t do derbies every single weekend (think Havens Schatt and Hope Glynn) as well as less established pros, amateurs and most juniors. 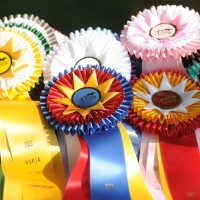 Everyone who came to Kentucky for Derby Championships competed in the Classic Round. Everyone gets to jump again in a handy round. If you’re in the top 30 spots, you get to go to the handy class that determines the overall championship, which is formally called the Tier I Final, but I’m dubbing the Championship Final. Another nine Tier II riders have been invited to compete in their own Tier II handy which is restricted to those riders. Everyone else is invited to the Consolation Round. If you’re a Tier II rider and finish 31st in the Classic? You go to the Tier II Final. So you’re a Tier I rider and finish 31st in the Classic? You go to the Consolation Round. Got it? Good. It gets a little confusing when we get to the payout and the ribbons. The confusion comes over how Tier II riders get their money and placings in the Championship and Tier II Finals. Both finals run more-or-less back-to-back, and there’s one awards ceremony at the end. The Consolation Round is its own afternoon clean slate competition that doesn’t figure in this conversation. Tier I riders in the Championship Final take home their paychecks and ribbons as you would expect. The rider with the top score gets the blue ribbon and the top check. Tier II riders in the Championship Final earn the money and placings from that Final, plus their score carries over to the Tier II Final scorecard and they get a second ribbon and placing for that Final. So the actual results of the nine riders in the Tier II Final class don’t determine the placings in that Final: the results from the Tier II riders in both Finals determine the placings. A Tier II rider who does well in the Championship Final will take home two checks, one based on her placing in the Championship Final, and one based on her placing in the restricted class. There’s more money to go around this year ($173,000 up from $110,000 thanks to entry fees with an add back component.). A Tier II rider who does well in the Championship Final will take home more money than a Tier I rider who does equally well. For example. Tier II rider Amanda Steege will be riding in tomorrow’s Championship Final because she placed 18th with Zidane. Let’s say Amanda is amazing tomorrow and ends up a cumulative score of 524.4. Perhaps that’s good enough for fifth in the Championship Final, and that score is so good, it’s the highest Tier II score of the day in either Final. That means she gets the Championship Round fifth place ribbon and corresponding check, plus the Tier II first-placed ribbon and corresponding check and she only had to jump once. If Peter Pletcher did equally well, he’s not eligible for the Tier II ribbons and cash. I know your next question: Why? In short, it’s about creating opportunities. First, you’re giving more chances to win money and prizes to more people without taking any prestige out of the overall competition. Also, this system will theoretically encourage an owner with several competitive mounts to reach out to fresh blood for at least one of the rides, given the opportunity to win more money. Can you get your head around it? It took me a little time and literally talking about it with someone else. Colleen promises that once we see it in action, we’ll really get it, so don’t fret if it’s not immediately intuitive. And if you think you have it, try explaining it to someone else, and see if you have it when you say it out loud. Check out the USHJA’s Derby Championships Page for more information, and to see which riders are competing in which Final.